Less than a fortnight ago, I found myself on Kipling's fabled road to Mandalay. Hubby and I had landed at Mandalay International Airport, about an hour's drive from Mandalay proper - "international" being a mildly amusing misnomer as the only planes which fly in and out of this white elephant come from within Burma itself, apart from the occasional flight to Kunming. 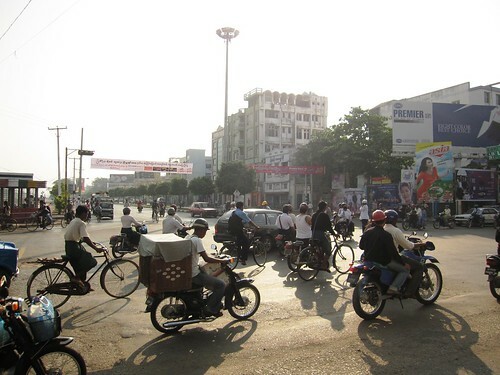 The journey to the centre of town is a joy - noisy, dusty, beautiful and bumpy with all manner of picturesque traffic like sidecar rickshaws, scooters and beasts of burden. I love Yangon with all my heart, yet it's not till I get to Mandalay that I feel that I've truly come home. Mandalay was never actually home for me, but it's where my beloved grandparents lived all their lives, and I've been back and forth since I was eight years old, so in some ways I feel like I grew up there. My father and both brothers were all born in Mandalay, but to my everlasting chagrin, I first opened my eyes in the rather more prosaic Margate. 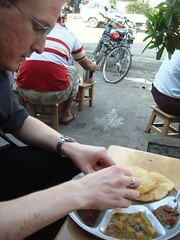 One of the other reasons I adore Mandalay is the plethora of street eats. 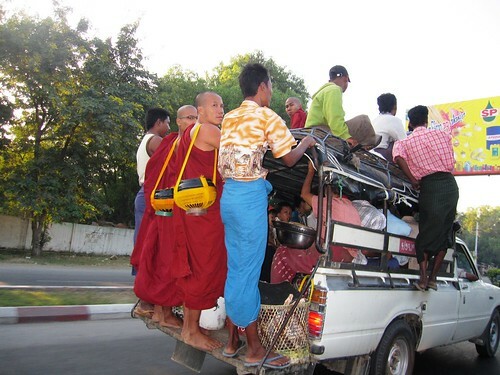 Safety rules and regs are few and far between in Burma (for example, car seatbelts have yet to manifest themselves), but a few years back in Yangon, some jobsworths saw fit to sweep away all the roadside vendors and most of the street cafes. But in Mandalay, such places persist and for this I am truly grateful. Our first port of call is this Indian tea shop called ပန္‌းသခင္‌​ (Hbun Thakin or Flower Lord), where we hunker down on tiny stools to be served one of the finest breakfasts known to man - a metal platter of aloo poori. First thing in the morning, nothing beats dunking huge, crispy, fresh-fried puffbreads in luscious curried potatoes, tamarind sauce and okra stew. On the side, there's samosas to snack on, cabbage shreds and onion chunks to crunch, lime to squeeze, and tiny chillies and mint leaves to chew. 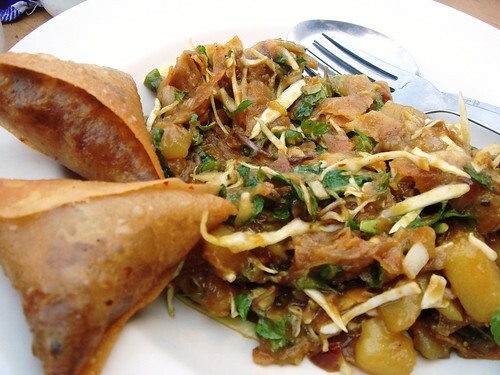 "One of the most unusual Burmese-Indian creations in the market is a samosa salad. 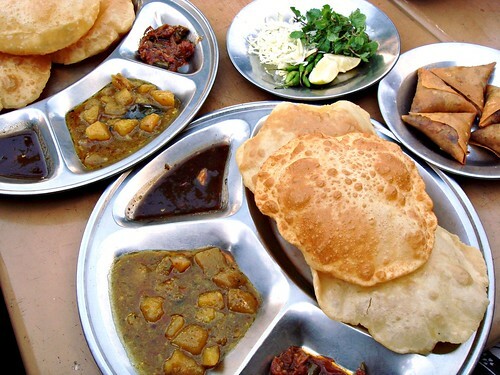 Two very Indian snacks, deep-fried, savoury pastries and split pea fritters, along with boiled potatoes and tomatoes, are crumbled and dressed with lime juice, as well as a sauce made with dal, rather like a thin, south Indian sambar". And now we're actually home, back in cold and blustery Blighty, and I'd give anything to be back on that roadside, sipping cups of hot green tea and chewing on sprigs of mint. 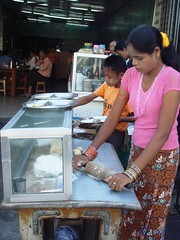 Fascinating post MiMi, really interesting to read about Burma and it's food. And I love Kipling. So interesting and wonderful food photos. Thanks for sharing this with us! I also enjoyed the Kipling references. WOW. No wonder you are longing to be back! The food looks delicious meemalee! It's morning and I'm starving! YUM! 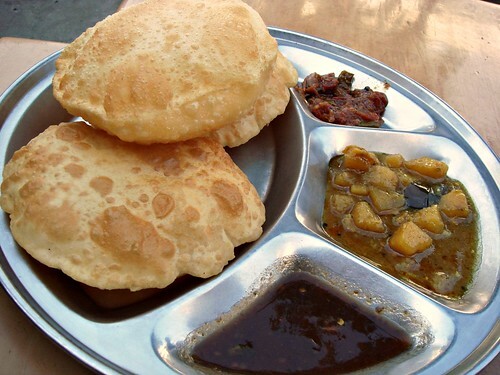 Pooris (Bengalis call them luchis)and potato; definitely my fave fried breakfast! Beautiful post. Sorry to rave, but good writing salves the wounds that life brings and your writing is exceptional. Gods, I'm guessing you're a copywriter or in advertising, but your metier is as a travel/cookery writer; you have a gift for it. One of my friends was a professional travel writer and another a very good anecdotalist and you combine both. PLEASE think about doing it for a living. AND you take excellent photos! @Dan - Thanks Dan! It's a bit strange for me to write about Burma but I'm glad people seem to be interested. 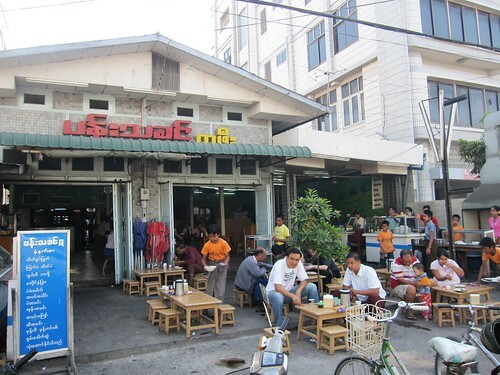 @Shayma - Ah, the Burmese love their South Asian food! Oh and I've heard good things about Burma Star - and other Burmese places in SF. What a lovely read and great pics too. The photos and descriptions of the food are seriously evocative. I'm wondering if I stare at the pictures hard enough, the food will appear in front of me. Sadly not, methinks. 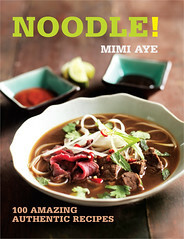 I don't know anything about Burmese food, so this has been really interesting reading. Such a shame that street food is being targetted by the beaurocrats - ruining it for us all. 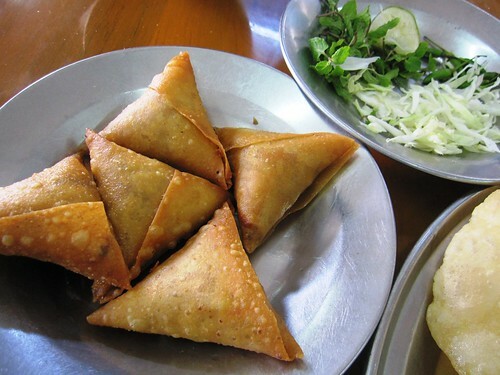 @Lizzie - Burmese food has, as expected, similarities to all the other Oriental cuisines, but also has South Asian influences. I'll definitely be writing more about it. I try to keep my comments limited, but I have to second your reaction to the leaflet; like all NHS advice it's "How can we avoid being sued", rather than saying "Use your common sense and look at how the food is prepared and cooked, and use your sense of smell!" I'm guessing that a restaurant with its prep facilities out of sight is more of a risk than a street vendor, in fact. 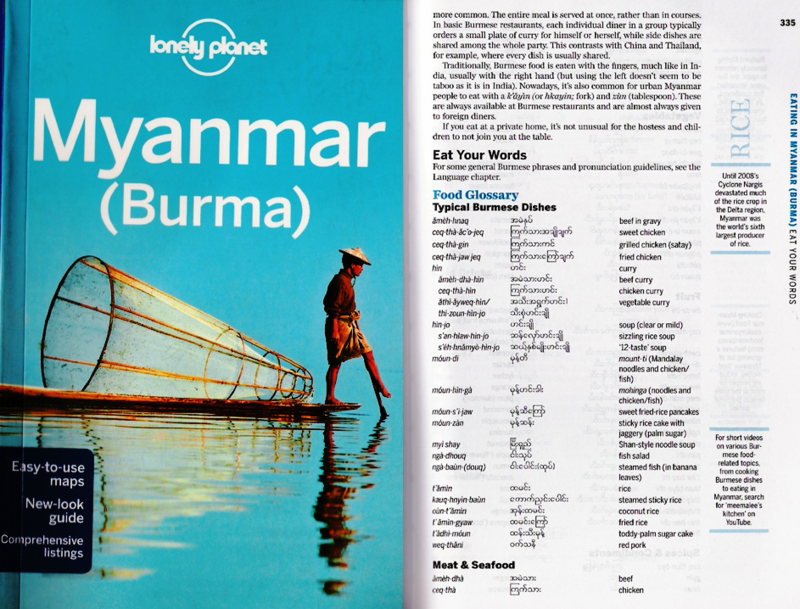 Would that be true in your experience of Burma?